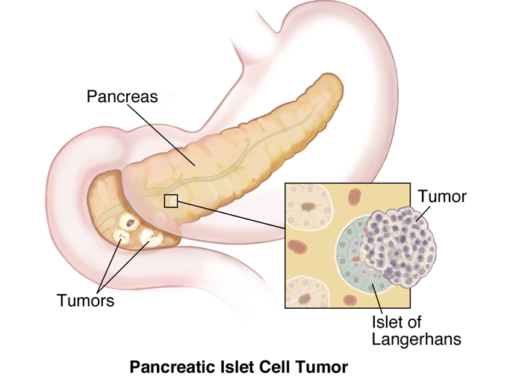 Pancreatic neuroendocrine tumor (PNET) is defined as islet cell tumors of the pancreas that make islet cell type hormones. PNET can be functional or non-functional. Most functional are more benign but still difficult to predict behavior and require close follow up. Most non-functional are more malignant (determined based on metastasis) because difficult to predict behavior. Indigestion, diarrhea, epigastric/abdomen pain, jaundice, palpable mass at right upper quadrant that is usually non-tender. Multiple ulcers (esophagus, stomach, duodenum, jejunum), elevated gastrin levels. Hypergastrenemia with ulcers refractory to conventional treatment. Vasodilation (flushing, hypotension), nausea vomiting, weakness. Watery Diarrhea with hypokalemia (hence muscle weakness), hypotension (due to loss volume). Hard to predict and need close monitoring. Some patient can choose the wait and watch approach if the lesion does not show aggressive behavior.